Shopping for Twin Peaks Bobble Heads? Ready to start his investigation. Special Agent Dale Cooper from Twin Peaks is in town! 7-inch scale resin bobble head features an excellent likeness. Based on the Showtime television series Twin Peaks. FBI Special Agent Dale Bartholomew Cooper, with coffee cup and microcassette recorder in hand, bobbles into town for a look around as this 7-inch scale resin bobble head based on the Showtime television series TWIN PEAKS. What do you think he'll discover? 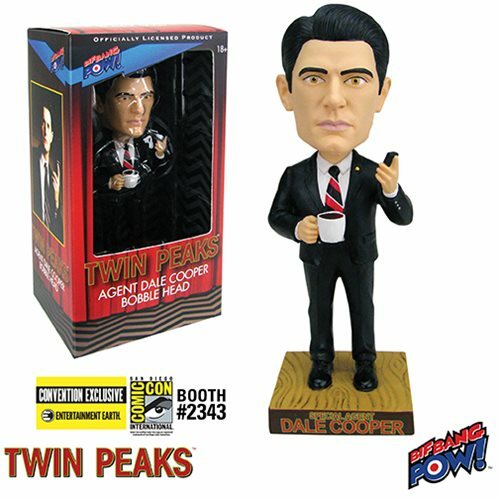 The Twin Peaks Agent Cooper Bobble Head features an excellent likeness and a base that displays the words "Special Agent Dale Cooper" on the front with the TWIN PEAKS logo on the back. Ages 18 and up.